Initially viewed from London as backward frontiersmen unsuited to modern warfare, Australian soldiers earned an unmatched military reputation in Palestine and on the Western Front in 1917 and 1918. When war returned in 1939, their participation in the Empire's defense was now eagerly awaited. At the beginning of the war both of Australia's armies (Imperial Force and Citizen Military Force) used the standard British Army tables of organization, with some exceptions. As the years went by Australian practice gradually diverged from British standards. 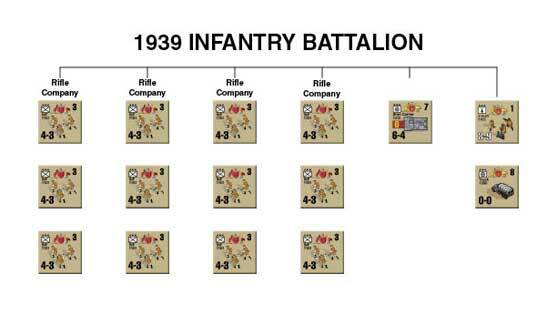 The 1939 battalion followed British practice with only slight variations. Among the changes, the Australians took the British Army's obsession with healthy feet even further and each battalion had its own chiropodist (apparently not always holding an M.D. degree) as well as a medical officer. Like the British battalion, the Australian infantry battalion depended on attachments from the divisional machine gun battalion for heavy machine gun support. In December 1941 the British Army issued a "Higher Establishment" for infantry battalions, increasing the strength of their rifle elements and adding an anti-tank platoon. Australia issued its own tables instead of following the British lead, though they retained the same basic concepts. Australian rifle sections (British Army parlance for "squad") had 11 men compared to 10 in the British equivalent (only nine in a British battalion in the Middle East). The extra Australian rifleman helped protect the section's Bren gunner; unlike the British the Australians appear to have provided more troops to man the new anti-tank guns rather than strip them out of the rifle sections. Some of these men may have come from the small motorcycle platoon assigned to battalion in Australia, but not to those deployed to a combat zone. As with the New Zealand Army, the "Left Out of Battle" policy made precise manpower levels a paper exercise anyway. 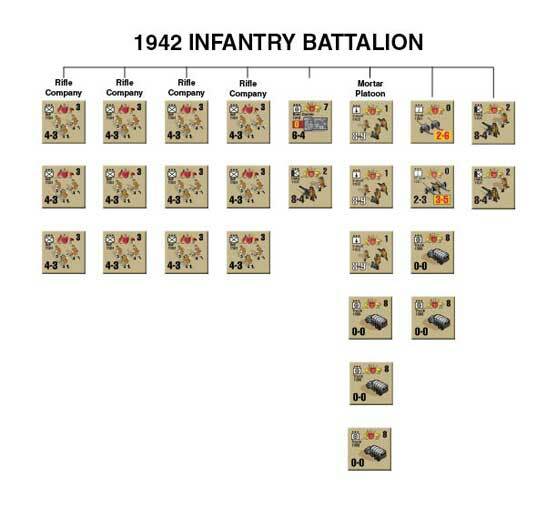 Before a major operation, each unit down to platoon level would tell off a varying number of officers and troops for garrison duty. In case of disaster, the unit would not be wiped out and these L.O.B. troops would form a cadre for rebuilding. Like the British Army, the Australians placed officers in charge of all maneuver elements: many companies were commanded by majors, while all platoons had a lieutenant in command. That made for a larger component of officers than in most other armies. By the end of 1942, Australian battalions had gained greater firepower, with a platoon of Vickers heavy machine guns and sometimes a second platoon armed with captured German or Italian weapons. A second anti-tank platoon also appeared, officially armed with 2-pounder guns. However, the Australians incorporated captured "bush artillery" into their units on a large scale and the useless 2-pounder often gave way to the deadly German 50mm gun or less-deadly (but still superior to the 2-pounder) Italian 47mm weapon. All of the armies fighting in North Africa picked up and used each others' weapons, vehicles and even uniforms to a great degree, and it became very difficult to identify their nationality at a distance. Australian Imperial Force divisions began leaving the Middle East for the Pacific Theater as soon as Japan attacked the Allies, while Militia units found themselves in a combat zone in New Guinea. 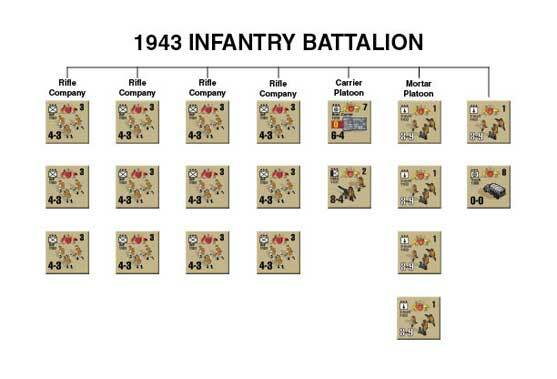 Both armies followed the same tables of organization, which shifted to match the new type of combat expected against the Japanese. They gave up many of their vehicles and the extra anti-tank guns and machine gunners, but added another section of 3-inch mortars. Upon leaving the Middle East, the Australians also gave up their captured weaponry; the low quality of Japanese gear disgusted Diggers used to picking up high-quality German and Italian items. Japanese guns and vehicles rarely saw any use by the Australians (or any other Allied troops outside of China) but as with the Americans, a few foolish and/or drunken Aussies managed to shatter a leg by trying to fire a 50mm "knee mortar" by bracing it against their knee. Australian operations would be marked by dogged courage at the lower levels, and a sharp reluctance at the higher command echelons to incur casualties. Searing memories of Gallipoli loomed over the older generation long before Peter Weir came along, and no general or minister would again allow Australia's youth to bleed away to no purpose. But when committed to action, Australia would be there. Click right here to order The Kokoda Campaign. Do it now. Mike Bennighof is president of Avalanche Press and holds a doctorate in history from Emory University. A Fulbright Scholar and award-winning journalist, he has published over 100 books, games and articles on historical subjects. He lives in Birmingham, Alabama with his wife, three children and his dog, Leopold. Leopold dislikes jungle, but likes to eat lizards.